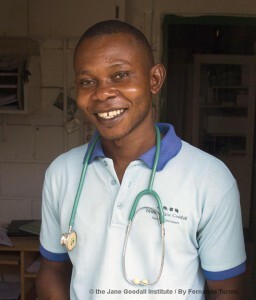 Hugues is a veterinary assistant at the Jane Goodall Institute in Republic of Congo. He provides support to the Dr. Rebecca Atencia, JGI-Congo’s executive director and veterinarian, as well as the rest of the staff at the Tchimpounga Chimpanzee Rehabilitation Center. Hugues previously worked as a nurse in a hospital in the town of Pointe Noire, some forty kilometers from Tchimpounga. With good references from Erbé Chikaya, the head of nurse at Tchimpounga, Hugues was admitted to the veterinary team of the sanctuary. Hugues quickly adapted to the new work since many of the medications used with chimpanzees are the same as with humans. Hugues says that what he likes most about his job is that he is helping save lives of chimpanzees. Hugues splits his time between the main sanctuary, and the Kouilou River islands, where many chimpanzees have been transferred from the old sanctuary. Some of them owe their lives to this brilliant veterinary assistant. Hugues is intelligent and very intuitive. He likes to investigate diseases. Since he arrived at Tchimpounga, Hugues skills have advanced considerable. He now operates X-ray equipment and microscopes with ease. Hugues also spends several days a month in Conkouati Douli National Park where he carries out the veterinary follow-up of a group of mandrills that JGI reintroduced there. Hugues believes that baboons are sociable animals and are capable of establishing strong emotional bonds. And,like chimpanzees, baboons have their own personalities as well. Hugues believes in the appropriate and careful treatment of chimpanzees and other primates, as this creates trust between veterinarians and the animals allowing the veterinarians to do their job effectively.